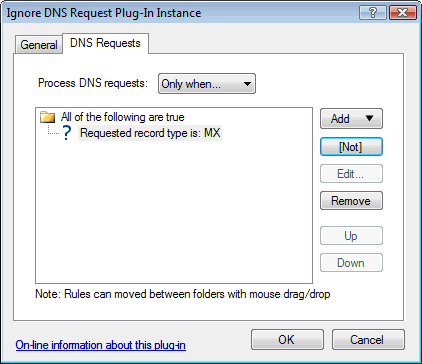 This plug-in instructs Simple DNS Plus to ignore (not answer) all DNS requests that the plug-in processes. This can be used to ignore requests from specific IP addresses, for specific domain names, record types, etc. As an example, you could configure it to ignore DNS requests from IP addresses listed by a blacklist plug-in.